The Hobby Lobby ad has been getting a lot of approving comment from like-minded Arkansas Republicans. I was wondering this morning if it strikes them as at all ironic that they celebrate July 4 and America's revolt against state religion by talking warmly of their own efforts to make their religion the law in Arkansas? Bro. Rapert, for example, circulated a video that said the country would be OK if only President Obama would follow Jesus. He means the Rapert version of Jesus, of course. You know. The one who wanted women, gays and foreigners to be treated as second-class citizens, but just never got around to saying it in public. Anyway. I thought I'd share the ad and explanation for those who aren't yet fully iimmersed in the First Church of Chick-fil-A and Hobby Lobby. The ad is a direct response to a series of July 4 ads sponsored annually by Hobby Lobby since 2008, which shamelessly promote the myth that the United States was founded on God and Christianity. The large craft store chain’s ads of disinformation appear to run in hundreds of dailies. Although FFRF can’t compete with Hobby Lobby by running ads in virtually every daily, it is undertaking the single most expensive ad campaign in its history to counter the Religious Right message. The ads quote U.S. Founders and Framers on their strong views against religion in government, and often critical views on religion in general. The ad features two revolutionaries and Deists, Thomas Paine and Benjamin Franklin, and the first four presidents: George Washington, John Adams, Thomas Jefferson and James Madison. 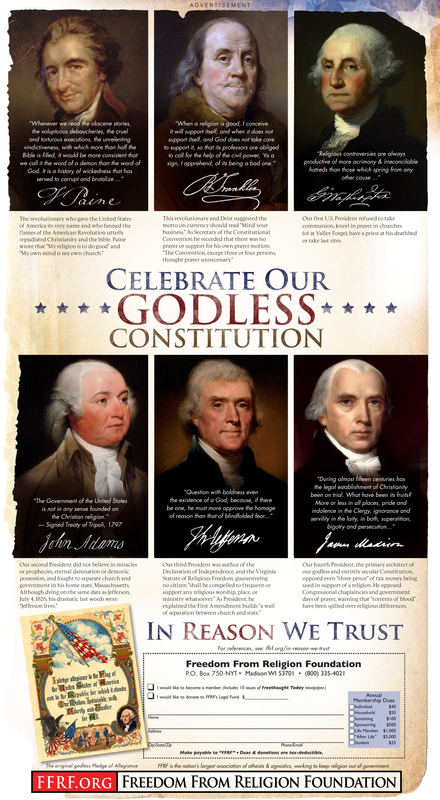 The ad documents that not only is the U.S. Constitution godless, but that there was no prayer during the Constitutional Convention, and that the Constitution’s primary architect, Madison, came to oppose government days of prayer, congressional chaplaincies and even “three pence” of tax dollars used in support of religion. The ad includes a website link that not only documents the quotations, but takes the reader to the original script in most cases!